As someone who tends to prefer modern graphics over the old-school JRPG kind, you can imagine my surprise when I found Project Octopath Traveler’s demo impressing me. 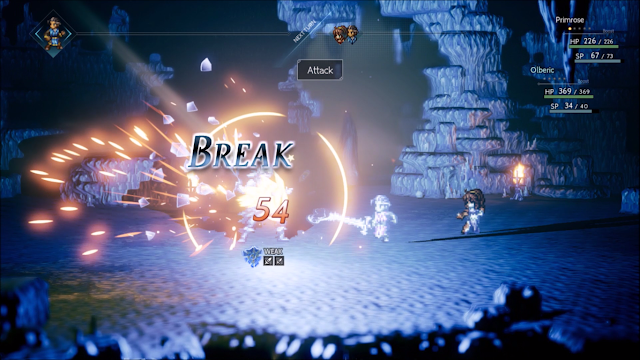 Don't be fooled by its 16-bit art style; Project Octopath Traveler boasts the polish of a current gen title in every way it should, from its well-written engaging preview at its story to a fun battle system that makes simple strategic additions to the turn-based system I already loved. As a game that was nowhere to be seen on my radar prior to this demo, this introduction to Project Octopath Traveler puts its best foot forward and shows an intriguing concept with a well done delivery so far. You could be forgiven for thinking Project Octopath Traveler is a strange word choice for this working title, but it makes sense when you consider its concept. 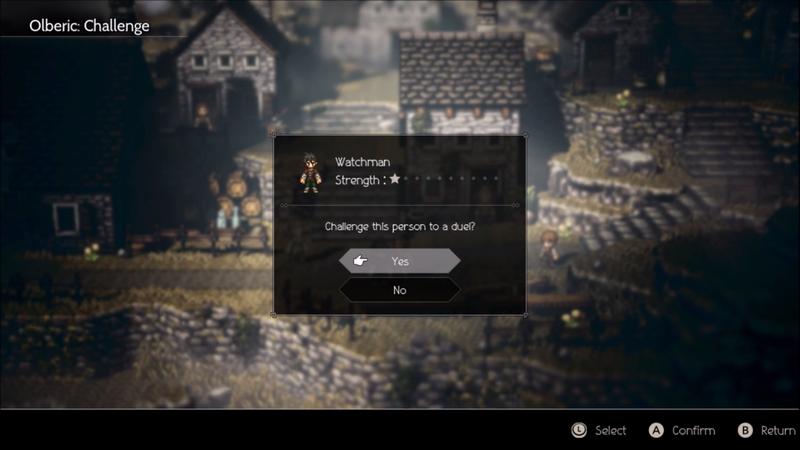 With ‘octo’ signifying the number eight, Project Octopath Traveler gives the player a choice of one of eight different heroes stories when beginning this JRPG journey. In this demo, the two characters Primrose and Olberic are available and are similar and different in a few ways. They both begin as heroes in-waiting, with the charming Primrose living life as a dancer working to a horrible master while she waits to avenge her father’s death, and Olberic, who is known as strong in his village, but mostly lives a peaceful life until it's time to protect his home from bandits. Their demo stories both feature a smooth arc into the beginning of their respective journeys that gives a little preview into each of the characters and both left a stronger impression on me than expected. 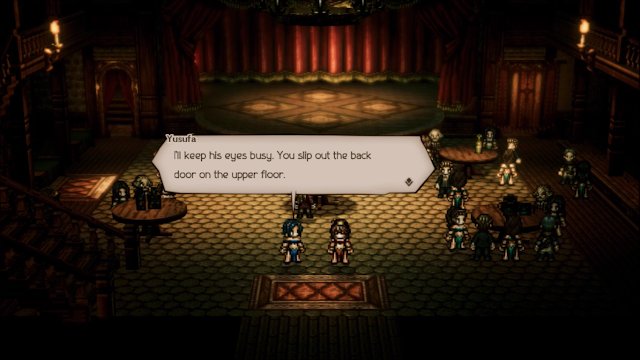 I don't remember having played 16-bit JRPGs much in my time, but despite the great things I’ve heard about them I wasn’t ready for them to have stories as captivating as Project Octopath Traveler did. Project Octopath Traveler’s story is made great thanks to its well-written and well-voiced characters and they are truly highlights to experiencing the fantasy story. Primrose was the character that I started my experience with and set the tone for it exceeding my expectations as I watched her and her silky voice allure those around her with perfect wit and charm that made her so likable while she was in an imperfect situation that made me root for her too. While I connected with her most, Olberic is an almost equally interesting character with his own pain and backstory and if these characters are the kind of quality that can be expected from the other six, I’d be more than happy to try them all. What makes the characters extra interesting outside the story is also their unique skills that tie to their character, such as Primrose taking advantage of her Allure to make people follow her or Olberic able to Challenge almost anyone around. It’s this tie of character to gameplay that makes both feel unique to play and I’m very curious to see how the other skills and characters will tie together. With two strongly written characters also come two competent battle partners in a system that puts its own twist on the usual turn-based JRPG fare. All the skills, magic and physical attacks you’d expect are there, along with a cool boost mechanic that allows you to either double your attack power or save up to five boosts to unleash a bigger one later. On top of this, enemies have shields that protect them from being hit hard and a tactical balance of using boosts and breaks to hit the enemy hardest is essential to beating some of the demo’s hardest bosses. I particularly liked that the demo included two decent boss battles that made me really learn the tactical value of the system, as I came to find it an engaging new addition to a system I already enjoyed. The added boost and break mechanics are a great refresh to a classic battle system and I’m tempted to keep playing until the demo level cap just because its so satisfying to break enemies shields to throw a bunch of hits at them. What sticks out to me most about Project Octopath Traveler is the amount of thought and polish put into pretty much every part of it. 16-bit landscapes glisten with little HD touches, such as shimmers in sand or sharp-looking magic attacks that somehow work with the contrasting old-school aesthetic. In fact, whether it be the narrative, gorgeous music and voices or interesting NPCs hidden around town, I lost the feeling I was just playing a more modern version of an old game style very quickly while playing because it all blends together so well. Project Octopath Traveler’s attention to detail and deep world so far matches modern standards in its own way and as someone not usually drawn to a 16-bit style, it was a pleasure to look at and explore. As someone who prefers modern aesthetics, Project Octopath Traveler is a pleasant surprise. There’s a lot of detail and love put into the story, world and characters so far and if this is carried throughout all eight paths of Octopath, I can see it being one to watch on the Nintendo Switch. If you’re looking for a deep story with a twist on old and modern fantasy JRPGs, Project Octopath Traveler may be an innovative, enjoyable surprise for you too and I highly recommend its free demo to JRPG fans with a Switch. You can pre-order Project Octopath Traveler at Play-Asia.com! Did you play Project Octopath Traveler? What did you think of it?